Dance the night away! Sing along with the best Big Time Rush Songs! Light up the Dance Floor with James, Logan, Kendall, and Carlos! 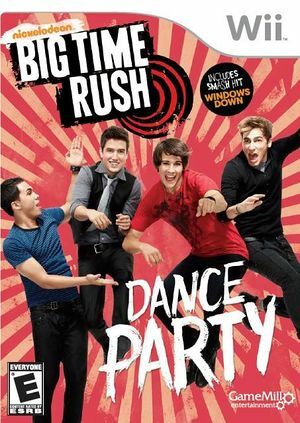 Big Time Rush: Dance Party allows players to dance to the beat of their favorite songs by Big Time Rush. Players will follow the boys from the recording studio to Big Time Concerts. The game has all their top hits, including the new song "Windows Down"! The more accuratley the players follow the moves of the boys on screen, the higher the score! The graph below charts the compatibility with Big Time Rush: Dance Party since Dolphin's 2.0 release, listing revisions only where a compatibility change occurred. This page was last edited on 6 January 2019, at 00:45.